Winemaker’s Notes: Yellow/green in color with aromas of tropical fruit, pineapple, peach, persimmon, and mint. In the mouth the wine is fresh and fruity with a touch of butter; a smooth wine with a medium body. Pairs well with seafood, chicken, pasta, and light dishes. My Review: I’ll admit that I wasn’t sure what to expect out of this bottle. Not only did I not know what the percentages on the blend were (though I’d make a rough guess that the Viognier and Sauvignon Blanc account for less than 10% of the wine), but blending two grapes not just from different regions in a state, but from different states, seemed odd to me. The wine was rather dark in the glass, a nice robust yellow and on the nose I got the typical Chardonnay notes of tropical fruit and pineapple. In the mouth I got more of the tropical notes with just a hint of citrus that I’ll chalk up to the “touch” of Sauvignon Blanc in the wine. Some of the wine had seen barrels, but I was pleased by how soft the finish on the wine was, especially given my wife’s distaste for oaked Chardonnay. Paired with a dinner of grilled chicken that had been liberally seasoned and some asparagus the overall crispness of the wine did a nice job of cutting through the bit of heat on the chicken. After the food was gone it was enjoyable enough to sip on. All in all the wine wasn’t a total disappointment, though I’ll also say it didn’t really grab my attention. I think my wife summed it up best when she described the wine as “not bad” with a shrug. 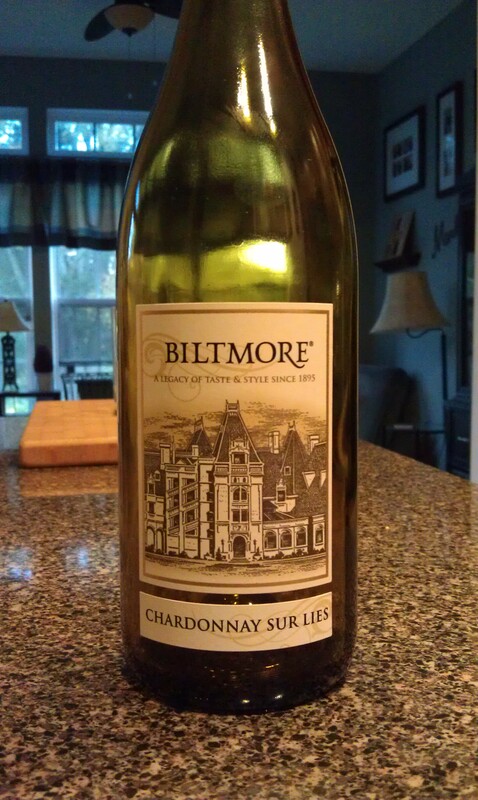 If you want to give the Biltmore Chardonnay Sur Lies a try and can’t find it in your local store, you can follow this link and order it online.